Industrial style is a really easy and gorgeous look to achieve while making your living room look really cosy and comfortable. You want a living space that is supremely inviting for you and your guests to relax in when they are over at your house so get inspired with these amazing looks. Industrial styles are noted for their exposed brick walls which adds some rustic chic to the room while these classic wooden elements makes it look more warm. Dress it up with a cosy white sofa and fluffy throw pillows for ultimate comfort. Concrete walls can seem a bit stark and cold until u add in the other bits of furnishings to warm up the room. This living room uses a neutral coloured palette with green as its accent to make it pop. The wooden crates used as the sofa is also an ingenious touch to make it look more lived in. Use dark tones in an industrial style living room with high ceilings to create a dreamy environment. The rough wood-lined floor and smooth ceiling perfectly complements each other while the black shelves make it look more rugged. Don’t be afraid to add some colours such as this cosy living room that incorporates a pop of sunny lemon yellow on its walls in place of wall art. The rest of the furnishings are kept in the popular neutral palette for an elegant industrial style. This loft living room’s high ceilings are put to good use with some modernised industrial style. The unfinished and rugged concrete walls perfectly embodies industrial decor while sleek and contemporary chairs provide comfy cushioning for a tired body. 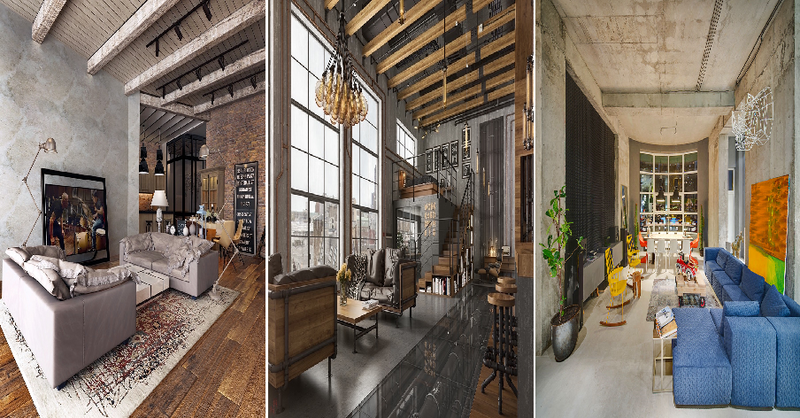 If you are lucky enough to have a loft with windows that spans two floors then put it to good use to light up a truly chic industrial space. Special elements such as the bolted concrete walls and geometrically patterned lights make it look more outstanding. This whole open space apartment is decked out in a very modern and sleek industrial style which are sure to wow your guests and make a statement. The floor and walls uses glass to expose some piping which adds character to your home while the hanging pendant lights and slate grey walls complete the look. Create the ambience of a laidback warehouse atmosphere with some exposed beams on the roof and the use of a faded looking wallpaper. Wooden furniture and comfy couches make the space look even more inviting. Who says industrial just have to use neutral colours? Incorporate bold and vibrant colours into your living room with the addition of a bright blue sofa, yellow chairs and red dining chairs at the table. Pull the whole look together with a colourful abstract wall art to warm up the concrete walls.